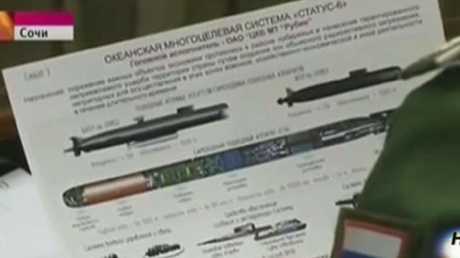 Russian blueprints for an unmanned underwater nuclear drone. THE Pentagon has confirmed that Russia has developed an unmanned underwater nuclear drone that has the potential to devastate US ports and harbours, according to a leaked government report. The revelation is one of many alarming findings in a draft version of the US's Nuclear Posture Review due for release next month. The paper, published by the Huffington Post, argues that America has been left exposed because Russia has continued to develop nukes since the end of the Cold War, while the US has reduced their role in its security strategy. The US Defence Department cites this risk - combined with growing military threats from China, North Korea and Iran - to argue for increased spending on nuclear weapons. 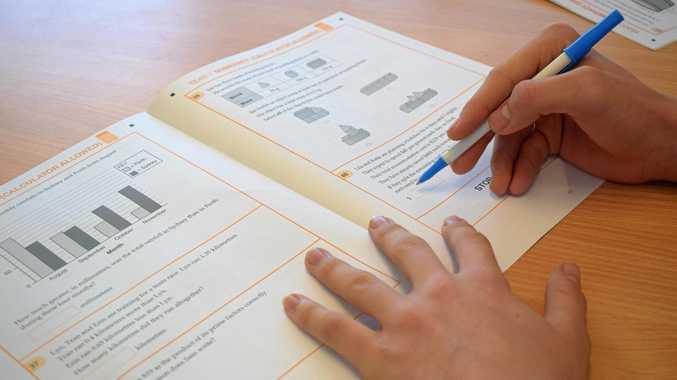 Russia has embarked on a "comprehensive modernisation" of its nuclear arsenal, the paper says. "Russia's strategic nuclear modernisation has increased and will continue to increase its warhead delivery capacity, and provides Russia with the ability to rapidly expand its deployed warhead numbers," the draft paper states. "In addition to modernising 'legacy' Soviet nuclear systems, Russia is developing and deploying new nuclear warheads and launchers. "These efforts include multiple upgrades for every leg of the Russian nuclear triad of strategic bombers, sea-based missiles, and land-based missiles. 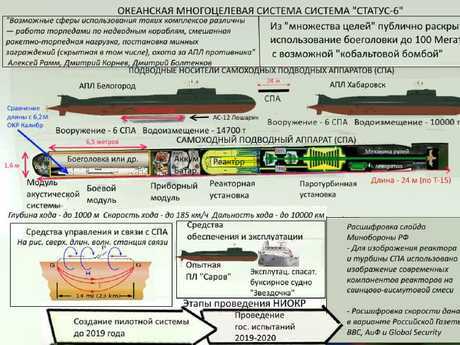 "Russia is also developing at least two new intercontinental range systems, a hypersonic glide vehicle and a new intercontinental nuclear-armed undersea autonomous torpedo." The mention of the "torpedo" is the first time the Pentagon has publicly confirmed the existence of the weapon, referred to elsewhere in the document as a "AUV", or autonomous underwater vehicle. Russia first teased that it was working on the weapon in 2015 when blueprints of the drone were filmed over the shoulder of general during a meeting with President Vladimir Putin and broadcast on state television. Experts argued at the time that the exposure of the plans wasn't an accident; it was a deliberate warning to Washington and the rest of the West. 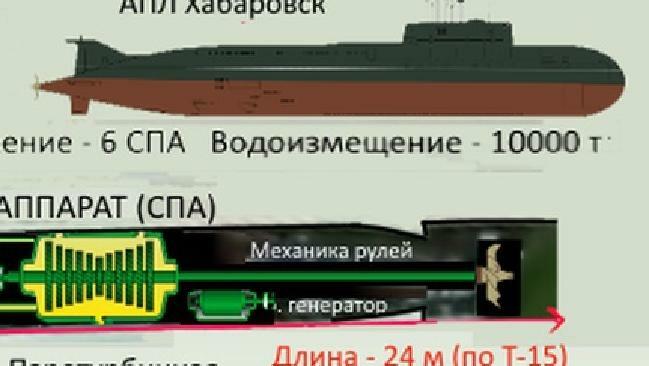 The Russian blueprint claims that the weapon, known officially as Ocean Multipurpose System Status-6, has a range of 10,000km, can descend 1km below sea level and can reach a top speed faster than 56 knots. It is designed to carry a 100-megaton nuclear warhead. According to a BBC translation of the plans, the drone is designed to "destroy important economic installations of the enemy in coastal areas and cause guaranteed devastating damage to the country's territory by creating wide areas of radioactive contamination, rendering them unusable for military, economic or other activity for a long time". The blueprints were caught on camera in 2015. While the Pentagon has admitted the risks of the Russians having this technology, there is no mention in the Nuclear Posture Review of the US developing a similar nuclear-tipped weapon. US intelligence agencies detected that Russia tested the drone when it was launched from a Sarov-class submarine in 2016, The Washington Free Beacon reported. "Status-6 is designed to kill civilians by massive blast and fallout," former Pentagon official Mark Schneider told the Free Beacon at the time. "The Russian government daily Rossiyskaya Gazeta reported that to achieve 'extensive radioactive contamination' the weapon 'could envisage using the so-called cobalt bomb, a nuclear weapon designed to produce enhanced amounts of radioactive fallout compared to a regular atomic warhead. "A cobalt bomb is a 'doomsday' weapons concept conceived during the Cold War, but apparently never actually developed." The weapon could be used to threaten the US's two nuclear missile submarine bases in Georgia and Washington state. 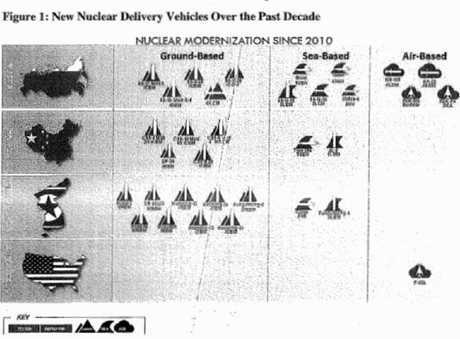 The leaked Nuclear Posture Review contains a graphic that shows the new nuclear delivery vehicles the US’s enemies have developed over the past decade. The Pentagon paper warns that the Russians have developed a "diverse" set of weapons that has given it an edge over the US. "Russia possesses significant advantages in its nuclear weapons production capacity and in non-strategic nuclear forces over the US and allies," the paper states. "It is also building a large, diverse and modern set of on non-strategic systems that are dual-capable (may be armed with nuclear or conventional weapons). "Russia's non-strategic nuclear weapons modernisation is increasing the total number of such weapons in its arsenal, while significantly improving its delivery capabilities." The Pentagon says Russia is modernising its ground-launched cruise missiles while developing its defences, including designing a ballistic missile interceptor. Russia believes its advanced nuclear weapons capabilities would allow it to "de-escalate" any conflicts in its national interests, but the paper argues the potential for a catastrophic misstep is high. "These mistaken perceptions increase the prospect for dangerous miscalculation and escalation," the document says. In a preface to the paper, defence secretary Jim Mattis writes that the review "comes at a critical moment in our nation's history, for America confronts an international security situation that is more complex and demanding than any since the end of the Cold War". The US's nuclear weapons stockpile has been reduced by more than 85 per cent since the height of the Cold War as part of a deliberate strategy to encourage other nations to reduce their arsenals. "These aspirations have not been realised," Mr Mattis writes. "America's strategic competitors have not followed our example. The world is more dangerous, not less." The paper ultimately argues for increased investment in the US's nuclear triad - which consists of land-based intercontinental ballistic missiles (ICBMs), strategic bombers and submarine-launched ballistic missiles. The Defence Department's "top priority" is to secure an additional 3 to 4 per cent of its budget to maintain its nuclear arsenal, which it says is essential to deter attacks from enemies. "Our goal is to convince adversaries they have nothing to gain and everything to lose from the use of nuclear weapons," Mr Mattis writes. He suggests continuing the weapons modernisation program started by the Obama administration to replace nuclear ballistic missile submarines, strategic bombers, nuclear air-launched cruise missiles and ICBMs. He also expresses the aim to boost investment in nuclear weapons laboratories, fighter bombers and F-35A fighter jets. This aim fits with reports last year that US President Donald Trump told military chiefs he wanted a nearly tenfold increase in the country's nuclear arsenal. This was the meeting that prompted secretary of state Rex Tillerson to privately slam Mr Trump as a "moron".